I opted to slice the shrimp in half, lengthwise. Not sure why, but that's what I did. Season the shrimp with the paprika, salt and pepper and set aside. In a medium-sized pan, cook the bacon until crisp. Add the shrimp and cook them for a couple of minutes just until they don't look translucent. Add 2/3 of the green onions. Remove the shrimp and bacon from the pan with a slotted spoon, leaving the bacon fat behind. In the same pan, add the butter, once melted add the garlic and give it a quick stir. Don't let it burn. Add the rice and stir well to make sure it is all coated with the garlic butter. 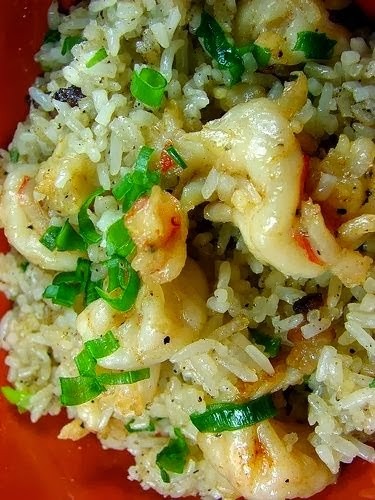 Incorporate the shrimp, toss and serve topped with the rest of the green onions.